A ROCKET REALLY just needs two things: mass to eject and something to push that mass out. In a conventional rocket, a fuel does both of these things. The fuel is ignited, providing energy, and then it pushes the leftover products of this reaction out of the rocket nozzle to provide thrust. How does that provide thrust? If you push on something (like the propellant), it pushes back on you. This is just one of the fundamental properties of force. So, that’s your introduction to rockets. And using those simple ideas, you can make a rocket using a soda bottle. Actually, there are three ways to make this happen. This is fairly simple and safe. The basic idea is to put water into a bottle with some air. Put the bottle upside down with some type of stopper and then increase the air pressure. 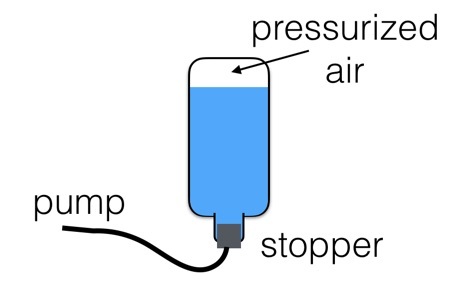 When you release the stopper, the air pushes the water out the bottom. In this case the ejected mass is the water and the energy comes from compressed air. It’s a pretty simple design—you can build it yourself or buy a kit. 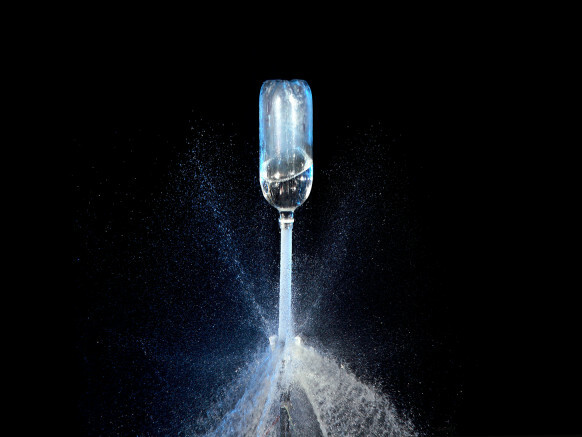 Here is a fancy homemade version of a water bottle rocket launcher (in slow motion). OK, here is one more water bottle rocket. This is an older all-in-one pump and launcher. Just one more note: If you like, you can also make more complicated water bottle rockets. Here is a design for a two-stage rocket. My friend and colleague, Dr. Eric Booth, shared an awesome video of a propane-soda powered rocket (I’m not sure if they use propane or butane). Of course he also wanted to see if we could reproduce the results, so we did. Here’s how it works. You start with some soda in a bottle and you pour a bit of it out (to make room for the butane). Next, you add the butane on the top of the soda. Butane has a boiling point of 30°F (-1°C). So, as a liquid, it’s pretty cold—oh, propane too (boiling point of -43.6°F). This cold liquid will easily boil and turn into a gas—but when you pour it on top of the soda, it’s sort of insulated. Liquid butane (and propane) also have a density less than water so that it will stay on top of the water. But all of this changes when you tip the bottle over. The butane mixes with the warmer soda and rapidly boils, producing lots of butane gas. 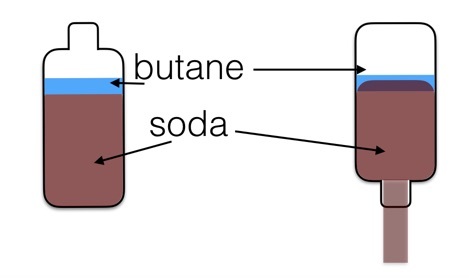 Since the volume of butane gas is much larger than the volume of butane liquid, this gas then pushes the soda out the opening of the bottle (which is now at the bottom). That’s your butane-soda rocket. The soda is the ejected mass and the expanding butane gas pushes this mass out of the bottle. I love this rocket because you launch it by just tipping it over and it just seems to hang there in the transition between falling and launching. Here is another slow motion launch. Now for your warning. This isn’t really something you should try on your own. First, butane is inflammable (or flammable—whichever way you like to say it). Second, the butane is super cold and can injure your bare skin. Finally, the plastic soda bottle can explode—especially if you get it too cold. All of those things could lead to bad stuff happening. But does it have to be soda in the bottle? Could you just use water? No, this is what happens when you replace the soda with water. I suspect that with the water you don’t get butane turning to a gas as quickly as with soda. It probably has something to do with the carbonation and boiling of butane at the same time. Clearly this could lead to further research for someone’s PhD dissertation. If you don’t have butane handy, you can use liquid nitrogen instead. Yes, that’s a joke. Most people don’t have access to left over liquid nitrogen (but I do). But there is one big difference between liquid nitrogen and butane—the boiling point. Liquid nitrogen is much colder, with a boiling point of -320°F (-196°C). Since it’s so cold, it boils faster when in contact with room temperature water. You don’t even need soda. Other than that, it’s the same as the butane-soda rocket. In my experience, the liquid nitrogen rockets were more powerful than the butane-soda rockets. Perhaps it’s just because it was easier to set up (once you have the liquid nitrogen) but they still went much higher. Be careful though. If you put too much nitrogen in the bottle, this can happen. I guess it’s a good thing liquid nitrogen isn’t so easy to obtain. But still, all three rockets do essentially the same thing—they push mass out the bottom to give an upward thrust. If you want to try this, I recommend sticking to the water-air rockets or try to build a two stage water rocket (that would be fun).